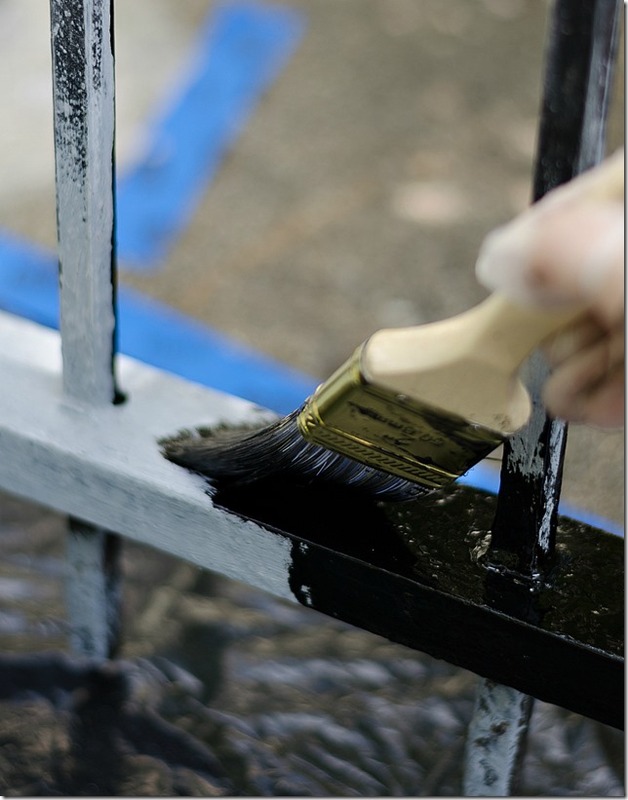 … and gave it two coats of a lightened version of the creamy yellow paint used on the railings and posts. Once dry, I taped off inner and outer borders and painted them with a glossy black enamel. Then I pulled up the tape and found a colossal mess: the porch is not a flat surface and the black bled into all the nooks and crevices. A change in plans was called for in the tune of stripes on the outer border to help hide my mistake. I spent two very long and frustrating hours trying to measure out diamonds. I ended up with a giant ball of painter’s tape and a second change of plans in the tune of a checkerboard pattern. The pictures of how I taped off the squares were lost when my laptop crashed yesterday. But this hand-drawn layout was invaluable as I mapped out the squares. The #1 squares were taped off and painted in with a lightened version of the green. Once dry, the #2 squares were taped and painted. As a final touch, I used a square stencil to add a black diamond detail. The jury is still out about whether I should add a coat of polyurethane. In the end, we now have a one-of-a-kind, custom rug on our porch. You can’t see it from the sidewalk, but it makes me happy every time I walk up the steps. This is so Wonderful!!! Thank You for Sharing! I REALLY like this painted porch rug. It fits your porch perfectly and adds a ton of character. Your pictures turned out great also. LOVE, LOVE, supper cute!! love the color & design you did. Newest follower, great blog! Great idea!! I wonder how it would hold up on cement? Stop by my place anytime. I am a new follower. I luv luv luv it, what kind of sealant is needed against scratches and peeling of the paint? 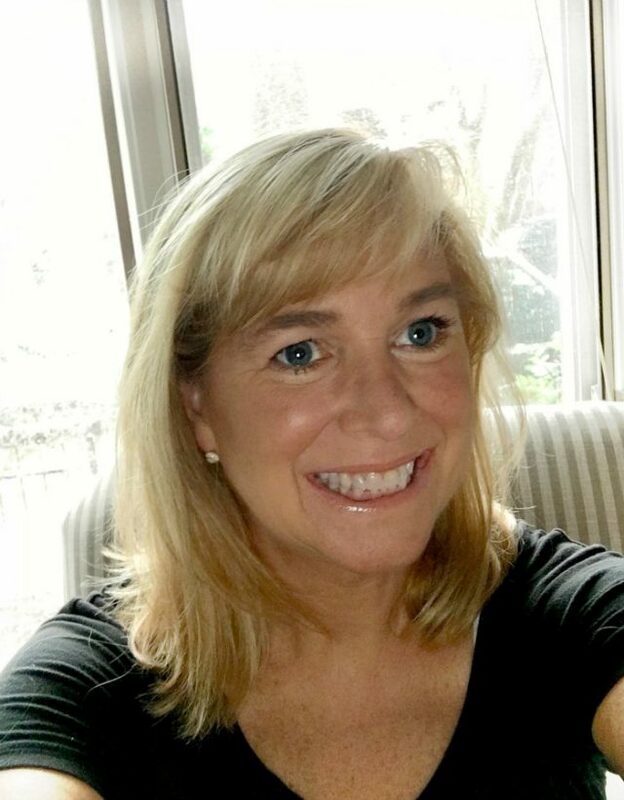 Welcome to blogging Linda! This project is genius! To even think about doing it requires a very creative mind! Vising from Home Stories link party. Love this project! Also love your blog – I’m following you now! I’m a native of the Chicago suburbs, now transplanted to the Philly area, so I’m especially fond of Chicago bloggers! Super cute and pretty..Your blog is soo awesome..adorable and creative..Love it.I’m Marilyn..Stopping in and officially following ya with smiles.Hope you can stop in sometime..http://theartsygirlconnection.blogspot.com ..TY..Off to indulge a bit in your posts :)). OMG, that was a lot of hard work and it turned out great. That is not a picture overload. I like pictures myself. Thanks for sharing at Wow. What a great looking piece, My furniture ‘s Old White is almost gone so I think I will mix it with various colurs and make it more attractive. Will be best looking with combo of white and lavender. I don’t like it … I LOVE it! 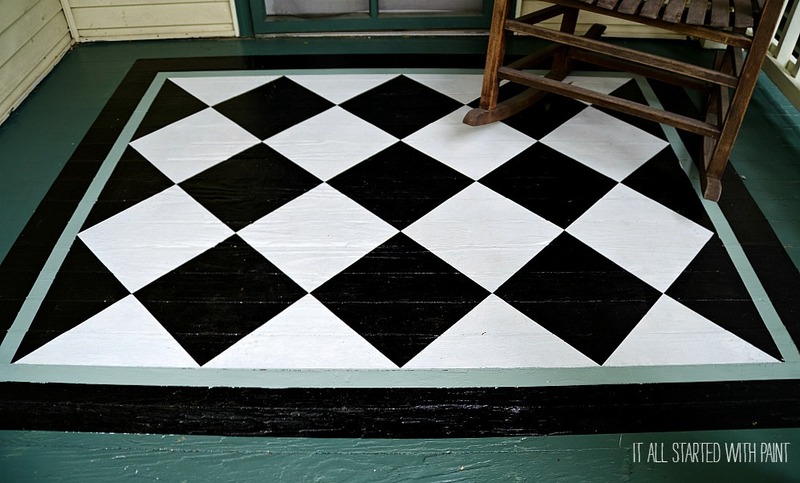 My front porch floor is painted too and I would love to add something like this … but how do you keep it clean? It’s so pretty I’d hate to step on it. 🙂 I’m now a follower. This is so adorable. I’m impressed! oh my goodness! What a labor of love!!! This is amazing…if I had a front porch, I’d be doing it tomorrow!! 🙂 following along now! 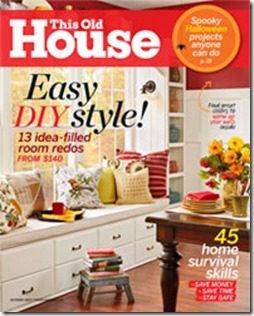 I love that you are a diy person like me! I too, am now following you. 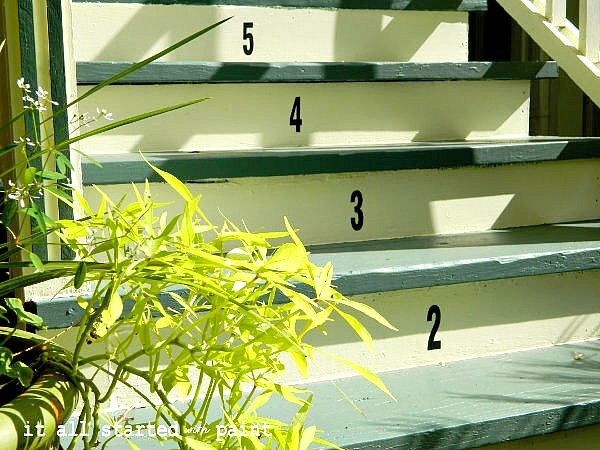 From one Jersey girl to another – you totally rocked out that front porch! Love it and love your blog. You have a friend (follower!) in me. You know what they say – you can take the girl out of Jersey, but you can’t take Jersey out of the girl! Well, this is just adorable and a great deal of thought and work went into it as well. The colors are perfect by the way. 🙂 Happy Thanksgiving!! Ha, Kim! You’ve got that right. I’m still drawn to shiny, sparkly things and continue to do my part in killing the ozone with my aerosol hairspray! I absolutely love this. It came out so great. Nice job! I love the colors and the design on the painted rug! 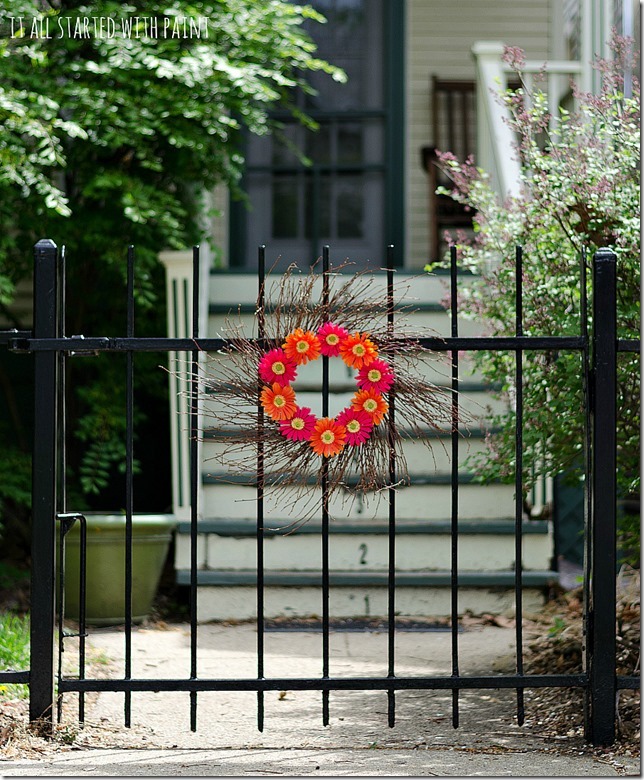 It is just the perfect touch for your welcoming entry! I’ll be featuring you tomorrow. Thank you so much for visiting my link party! What a great porch!! Thanks for sharing at my party. I can’t wait to see what you have next week. What an awesome idea! This one is going on the list. Thanks! Great job! This is a great idea. I love your blog, btw. this is such a great idea! i have been mulling over what to do with our back porch as the paint keeps wearing off and showing the 3 other colors we’ve painted it! i think i will paint a “runner” on it and seal it. it will be grand…just like yours. One of the best ideas in Blogland!!! Love the many pics. You should be proud! What a great project! You should be proud. I can’t wait to try this in my upstairs hall. I’m thinking a soft yellow and gray. Thanks for a great tutorial. What a great projects.I really like this idea.Thanx to share with us.I really try it.Such a inspirations idea. Love, love, love, love, love. Did I mention I love this? And if you scroll down one of the readers included a link that is concrete specific about prepping the surface first with appropriate primer. Linda I love it! Thanx for showing us all how to make our own painted rug and for partying at tHT! I’ve been reminded of your great front porch painted rug over at Southern Hospitality’s Summer Porch Party. (I’m sitting on my front porch looking at front porches. : ) I love this project of yours! Had to pin this one as a “must do” project for this year! Great work, Linda. I am so going to do this on my front porch! Thank you for sharing this project. I’m about to inherit my parent’s house which needs SEVERE attention both inside and out. I fully intend to paint the cement floors inside (they’re covered with 25+ year old carpet now) since I have yet to become rich OR famous, but (isn’t this ironic…) it never occurred to me to paint the back patio (there’s not much in the front). It’ll be a great way to bring some color to the desert background! I love it! That is such a clever idea!! I love it….I wish I could do this to my front porch but it’s cement, I guess I could always try and if it doesn’t work just paint over it…..thank you for the inspiration. There was no need to apologize for “picture overload” and you should be proud of your work. I am a porch contractor in Massachusetts and am guilty of taking too many pictures myself.